Agriculture was always a problem for the Soviets from the very start of the communist regime, which is not surprising given the fact that communism was an urban movement based on workers. Peasants were very suspicious of the Bolshevik takeover, and during the Civil War the Bolshevik regime essentially survived by forced grain requisitions from the peasants ("war communism")--You can imagine that that went over well in the countryside. During NEP in the 1920s--"the deal with the devil"--farmers were obligated to produce a fixed amount of grain, etc. for the state, and they could sell anything else on the free market--You know how well that went over with hard-line communist believers. 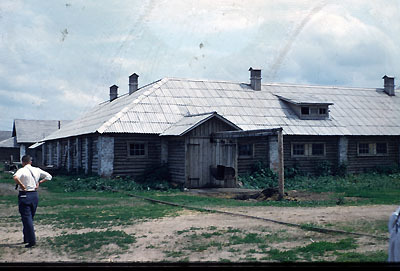 With collectivization in the 1930s, Stalin literally bled Russian agriculture to build an industrial superstructure. Private holdings of land, equipment and farm animals were seized, and then peasants were forcibly organized into collective farms. Agricultural quotas for the farms were determined by communist party officials and placed relatively high--You can imagine how that went over in the countryside. 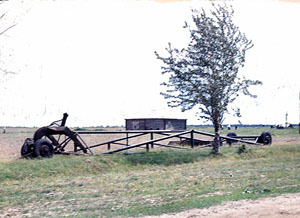 World War II destroyed much of the agricultural infrastructure in European Russia, and then Stalin reinforced collectivization after the war to undertake the re-building of Russia. 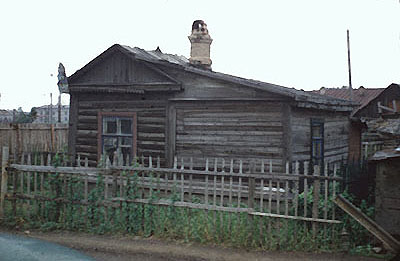 Russian countryside circa 1960. American farms still used some horses at the time, too. When Stalin died in 1953, and Khrushchev became head of the communist party, he decided that if Russian was going to be a superpower, then it needed to solve its agricultural problems; Khrushchev tried hard. 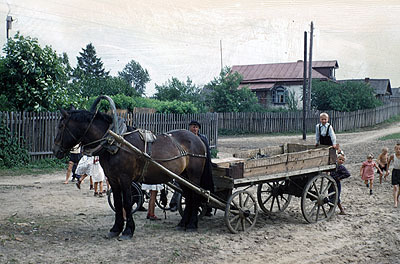 Russian agricultural production in 1953 was not much higher than it had been in the 1920s, and corn was non-existent. There were also not enough farm animals, and mechanization was not very well along. Khrushchev also needed something to put against Malenkov's call for more consumer goods. So K came up with the Virgin Lands scheme and also the idea to promote corn cultivation. They were inter-related. If Soviet leadership wanted more meat and milk for the people, then there had to be more corn to feed animals. If you were going to try and plant corn, then you still needed to maintain the existing extent of wheat cultivation. So how to fix the conundrum? Khrushchev launched the Virgin Lands campaign in 1954. I'm imagining now, but I could guess that K and some high-level communist leaders were sitting around a table one night with some coffee and other drinks, brain-storming; and someone said, "if we could only increase agricultural output. We'd give people some more food. Get people happy about being communist and also be able to save some money by not having to buy corn and grain abroad for animal feed." "Boy that sure sounds fine," someone else might have added, "but how?" K, as leader, then might have said, "Let's look at one of the maps of wheat planting." "Look," and a finger pointed at Kazakhstan in Central Asia. "All that land for cattle grazing but no wheat." "What if we plowed it up and planted wheat?" And so the Virgin Lands program came to life one day. 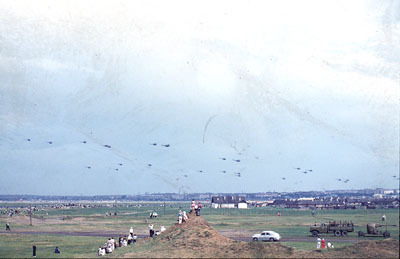 Look, it is a terrible photo, but it is the Russian countryside in 1960. So, the Virgin Lands campaign focused on bringing under cultivation the semi-arid tracts of unused lands in northern Kazakhstan and also in the Altai region of Russia. 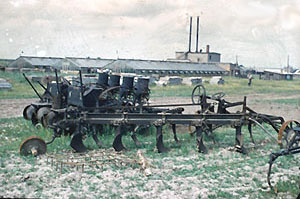 Khrushchev hoped to to increase the cultivated area in the USSR by about 30 million hectares of land (1 hectare = 2.4 acres). What Khrushchev got was an increase from about 100 million to 128 million hectares with increases in both wheat and corn planting. Allegedly, in the first year of the program, about 190,000 km² were ploughed up, and in 1955, an extra 140,000 km² were ploughed. To undertake this immense effort, a lot of people were needed. Hundreds of thousands of Ukrainians, Russians and others moved to Kazakhstan and the other Virgin Lands to become farmers--not too many of them had farming experience. Tens of thousands more went to the areas on a transient basis to help with harvesting and other seasonal tasks. 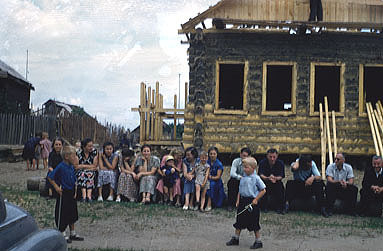 Soviet citizens generally undertook the program with some enthusiasm. The country seemed to be moving forward again. The 1955 harvest was a failure, but the 1956 harvest was a huge success, and you know how important the year 1956 was for Khrushchev. It really helped his support that the Virgin Lands produced such a bountiful harvest that year. Unfortunately for K, the results were never duplicated, and the Virgin Lands long-term failure became one of the "hair-brained schemes" charged against Khrushchev when he was ousted from power in 1964. There were a number of reasons for the long-term failure of the scheme. Nearly all of the new farms grew only wheat, and there was not a whole lot of expert farming experience put to work. There were no efforts at scientific crop rotation, and not a lot of fertilization. Also, few measures were taken to prevent erosion (by wind), and most of the topsoil, in time, simply blew away, making it useless for cultivation. There were also irrigation problems (see, for example, the environmental catastrophe that is/was Aral Sea). Finally, even more laughable, every year much of the crop that was harvested spoiled for lack of proper storage facilities. 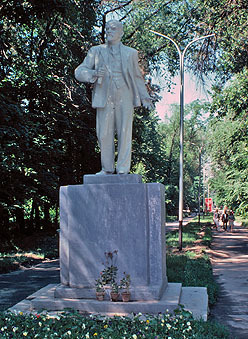 You can find statues of Lenin everywhere in Russia--well, at one time you could--even in a small park in Almaty in Kazakhstan. So why does Lenin appear in these notes about the Virgin Lands? Well, it is my way of getting to the point that the Virgin Lands also had a demographic impact on Kazakhstan. Some details first. The Republic of Kazakhstan is part of the Commonwealth of Independent States (former pieces of the Soviet Union) with a population of about fifteen million people and an area of about one million square miles. The largest city is Almaty (aka Alma Ata) with slightly over one million inhabitants. According to Wikipedia, Kazakhstan is the ninth-largest country in the world by area, but its semi-arid desert steppe makes it only the 57th country in population, with approximately 6 persons per sq km (15/mi²). The Virgin Lands campaign brought a lot of non-Kazakhs to Kazakhstan to deal with the new farming. These included Russians--although there were already a lot of Russians in Kazakhstan dating back to imperial times--Ukrainians, and also Chechens, Ingush, Kalmyks, Crimean Tatars, Volga Germans and others. The immigrants were also primarily young males which further altered the demographic balance in the country. In some major areas of Kazakhstan, Ukrainians and Russians out-numbered the native Kazakhs. And so, as a result of the Virgin Lands influx, there is still a sizable non-Kazakh population in Kazakhstan: ethnic Kazakhs (58-60%), Russians (25-27%), with other minorities (15-17%). 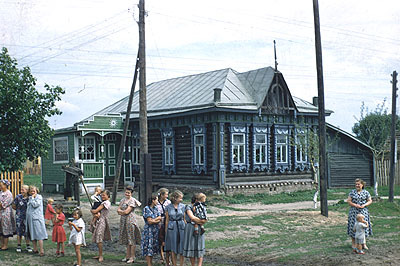 Here are some other assorted photos of the Russian countryside from around the early 1960s. Those little dots in the sky are some Russian military helicopters on some sort of military exercises. Look at all the people watching them. Again, a bad photo, but this is a photo of a collective farm building.